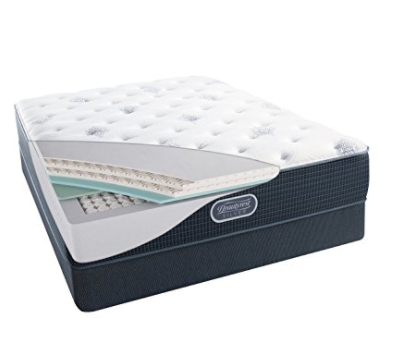 However, it’s important to know what to look for before purchasing a mattress on Amazon, in order to avoid being stuck with a mattress you’re unhappy with and can’t return. In this page, we’ll discuss how to be a savvy Amazon shopper. This means knowing how to assess a mattress’ quality, including what type of materials are the best fit for your personal needs. Aside from the mattress itself, when shopping on Amazon, it’s important to be aware of its shipping cost, warranty, and the trustworthiness of its reviews. There are plenty of great mattresses to be found on Amazon, and we’ll share some of the best-reviewed mattresses on Amazon for both premium shoppers and those on a budget. If you’re buying a mattress on Amazon, there are several things to look out for that you might not need to consider when purchasing from a brick-and-mortar retailer or a company’s website. Here are a few things to be aware of as you shop. Carefully read customer reviews. It’s not unheard-of for mattress companies to plant fake reviews, so use your best judgement in assessing them. When reading reviews, look for high ratings, but also high numbers of reviews. If only five people have rated a mattress, it’s not a safe bet. Check the warranty. Many mattresses offer extended warranties, but Amazon’s return policy is often far more limited than the one provided by the company itself. If you’re confused about which one applies, reach out to Amazon customer service for clarification. Know the seller. Some mattresses on Amazon are sold through the manufacturer, some by Amazon itself, and some come from third-party vendors. Be clear about just who you’re buying from and how that will affect the warranty and customer service you can expect. Demand a sleep trial. There’s always some risk involved with buying a mattress online. Even if it’s a great product, it might not be right for you, which is why most manufacturers offer sleep trials to test a mattress out. However, while a mattress company might offer a sleep trial of 90 days or longer, Amazon often has a 30-day return policy. Look at shipping costs. 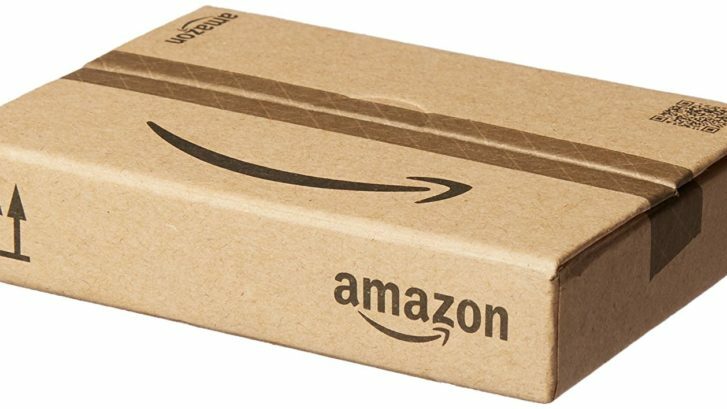 Amazon Prime memberships often offer shipping for free or at a low cost. Without that, the size and weight of a mattress can often lead to shipping fees that can add a lot of money to the final price. Know the return policy. It’s important to know ahead of time how a seller handles returns, should you need to send the mattress back. Pay particular attention to who is expected to pay for return shipping. Most people who’ve purchased mattresses on Amazon have had positive experiences. However, as you’ll learn from reading reviews, some customers have been unhappy either with the quality of their mattress or their ability to return it. Before purchasing, carefully weigh the pros and cons so you’re sure you’re not taking an unnecessary risk. Speed: When shopping on Amazon, a new mattress is only a few clicks away, since you’re using a website you’re likely already familiar with. Amazon also boasts fast delivery speeds that can have your new mattress at your door faster than many retailers. Selection: Using Amazon allows you to quickly browse mattresses from multiple manufacturers, comparing quality, price, and reviews. Price: You can often find a great mattress on sale through Amazon for much less than you’d pay elsewhere. Confusing policies: It can be difficult to figure out exactly who is responsible for your warranty, sleep trial, and returns. However, knowing who to contact in the event of a problem is crucial to avoid being an unsatisfied customer. Reading reviews: Amazon’s review system is a great way to find out what real users think of a product, but knowing which ones are helpful or trustworthy can be a challenge. Setup: Mattresses can be very heavy, which is why many online retailers include help with setting up in their delivery policy. This is rarely the case with Amazon, so consider the weight of a mattress before you purchase. Amazon offers a huge variety of mattresses to suit any budget or sleep style. In choosing the best mattresses on Amazon, we’ve relied on our own research and customer reviews to find the best mattresses across multiple price points and materials. If you’re unsure which type of mattress is right for you–innerspring, latex, memory foam, or hybrid–visit our page on mattress support cores to learn more. 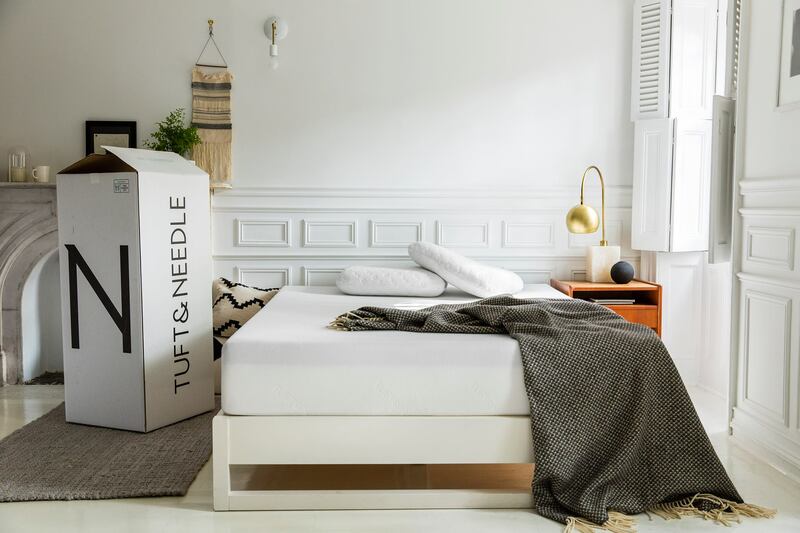 Tuft & Needle promises a “universal comfort” experience for sleepers of all shapes and sizes. Using a proprietary foam blend, Tuft & Needle is constructed from a firm foam support core, and a softer foam comfort layer. The comfort layer is infused with cooling gel to offer a breathable sleep experience, unlike some memory foam mattresses, which can become uncomfortably hot. 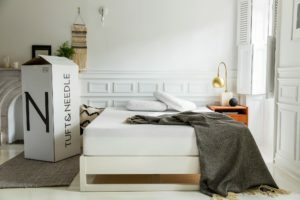 The Tuft & Needle mattress is known to be relatively firm and have high motion isolation, which is excellent for couples who don’t want their partners to disturb them. However, the firmness may be too high for some side sleepers. Visit our full review page for more information on the Tuft & Needle. The Tempur-Pedic TEMPUR-Cloud line is constructed with five layers of foam, from the very firm inner core, to the body-contouring outer layers. The TEMPUR-Cloud line includes the Prima, which is listed as medium-firm, and the Supreme and Loft, both of which are soft. The soft options are great for sleepers who change position often, but may not provide adequate support for back or stomach sleepers. For those who enjoy feeling cradled and enveloped by their mattress, Tempur-Pedic’s unique foam is a good choice. This bed comes with a 10-year warranty, but customers should make sure ahead of time that Amazon will honor it. 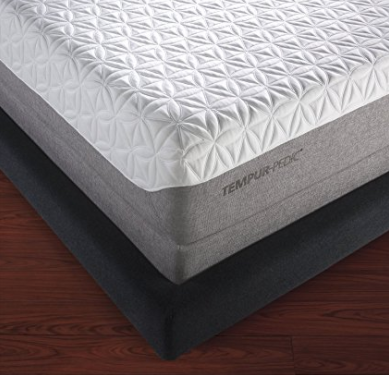 Learn more about the Tempur-Pedic TEMPUR-Cloud mattress in our full TEMPUR-Cloud mattress review. Purple: The Purple Bed is made of an unusually cool and breathable polyfoam, which combines both motion isolation and some bounce, in a way appreciated by many couples. The Purple Bed is also hypoallergenic, and its price point falls roughly in the middle of budget and premium. Read our full review page for more on the Purple mattress’ strengths and weaknesses. Zinus Green Tea: Boasting some of the best reviews for a mattress at its price point, the Zinus Green Tea is a good choice for customers on a budget. It offers high motion isolation and pressure point relief, though customers have complained that the mattress can be slow to expand to full size when unboxed, and that it takes some time for the initial odor to dissipate. Read our full review page to learn more about this mattress. Lull: In its short time on the market, Lull has earned a reputation for great customer support, and this mattress offers a 100-night sleep trial when you purchase on Amazon. The Lull offers great spinal support and motion isolation, though some sleepers have noted that it sleeps warm, especially as it ages. Read our full review for more information about the Lull mattress. Signature Sleep Memoir: Like the Zinus, the Signature Sleep Memoir mattress comes well-reviewed at a much lower price than most memory foam models. It’s relatively lightweight, which allows for easy at-home setup, though the company notes it can take up to 72 hours to fully expand, during which time there may be significant offgassing. The Simmons Beautyrest Silver Plush 500 is an innerspring mattress topped with four layers of memory foam for comfort and support. The Plush is the softest of the Beautyrest models, though it’s still rated as medium-firm, making it a good choice for heavier sleepers. Users have also praised the edge support, which is excellent considering the price point. This mattress comes with a 10-year limited warranty, though some customers have complained about unresponsive customer service and difficulty making a return. 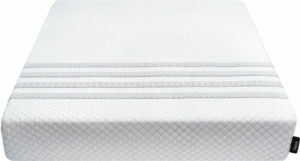 WinkBeds bills itself as a “hybrid mattress,” since it features two layers of pocketed coils, four layers of foam, a lumbar pad, and a perimeter layer of foam for edge retention. This makes is one of the thickest mattresses on the market, at 15”, with a heavy weight to match. WinkBeds offers a 100-night trial period, though it doesn’t allow returns until after 30 nights, to allow for some softening of the coils. For more information on WinkBeds’ unique construction, read our full WinkBeds review page. Brentwood Home Oceano: Brentwood prides itself on using materials that reflect its “California ethos,” meaning that they are healthy and environmentally friendly. This mattress features two layers of individually-wrapped coils, two layers of foam, and a topper made of cashmere, silk, and New Zealand Wool. These materials come with a higher price tag, but this mattress boasts many satisfied customers. To learn more about the Oceano, read our full Brentwood Home Oceano mattress review. The DreamFoam Bedding Dreams Latex Mattress is made from a hybrid of natural and synthetic latex, with a bamboo-derived cover. This makes it one of the more organic latex mattresses at its price, and it’s certified to be hypoallergenic and non-toxic. This mattress is highly customizable from soft to firm, and users praise its responsive customer service, which is dedicated to helping you find the right firmness level. The Spindle mattress is constructed of natural latex and organic cotton, making it highly organic and highly durable. Customers rave about Spindle’s customer service, with many sharing stories of Spindle employees going above and beyond to resolve issues. As with most high-density latex mattresses, the Spindle is quite heavy, and is shipped in three separate pieces, which customers must assemble themselves. While some dislike this, others enjoy the opportunity to rearrange the different layers and experiment with firmness. To learn more about the Spindle, read our full Spindle mattress review. Sleep On Latex Pure Green: The Sleep On Latex Pure Green is a highly organic mattress constructed of all-natural latex, and organic cotton and wool. This makes it breathable, durable, and odor-free. The high-density latex is quite heavy, which can make initial setup an issue. Customers can choose from three firmness levels. GhostBed: The GhostBed is a latex and gel memory foam hybrid that bills itself as “the coolest mattress in America.” This mattress offers unusually high support for a foam hybrid, though it may actually be too firm for some side sleepers. For more information on the GhostBed, read our full GhostBed mattress review. PlushBeds Eco Bliss: Another latex-foam hybrid, the PlushBeds Eco Bliss is somewhat organic. It uses natural latex and synthetic foam made without harmful chemicals. This mattress rates high for comfort, but is not ideal for heavy sleepers or those who prefer a very firm mattress. 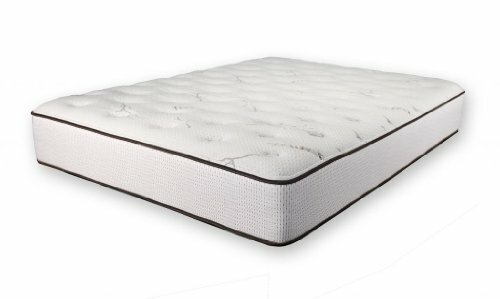 Signature Sleep is an ultra low-cost mattress that combines a coil support core with two layers of foam. Like many “bed-in-a-box” models, the Signature Sleep Contour Reversible Mattress can take several days to fully expand, and some customers have complained of a strong initial smell. Reviewers praise the Signature Sleep’s value, though its low cost means that you can expect a relatively short lifespan. The Sapira is a very well-regarded mattress that has a support layer of pocketed coils surrounded by four layers of foam. This mattress is ideal for heavier sleepers and back sleepers, since it provides excellent edge retention and overall support. It’s also popular with couples for combining the motion isolation of foam with the bounce of coils. The Sapira offers a 100-night sleep trial and a 10-year warranty. Some customers have noted that this mattress was firmer than they initially expected, but many have also written that this wasn’t a problem once they got used to it. Read our full Sapira mattress review for more information. Voila: The Voila combines coils, latex, and gel-infused memory foam for a luxury mattress at a reasonable cost. The layers conform to your body, which is particularly good for back and side sleepers. The Voila offers a 100-night sleep trial and 10-year warranty. 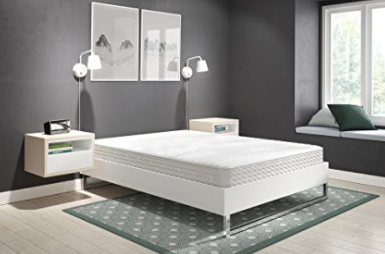 LinenSpa Memory Foam and Innerspring Hybrid Mattress: The LinenSpa Hybrid comes highly reviewed, especially considering its low cost and the simplicity of its design. The LinenSpa features steel coils topped with a layer of memory foam. This mattress comes with a 10-year warranty, though its durability may be limited for heavier sleepers. Olee Sleep Box Top Hybrid: A step up from “ultra low-cost” mattresses, the Olee Sleep Box Top Hybrid features a support core of pocket coils topped with five layers of foam. Customers have praised this mattress for its coolness and motion isolation. Setup may be a challenge, as this mattress is heavier than most hybrids. Classic Brands Gramercy Euro-Top Hybrid: Another coil-and-foam hybrid, the Classic Brands Gramercy is well-reviewed for comfort. Featuring two separate layers of ventilated gel foam, this mattress sleeps much cooler that many foam mattresses at its price point. Like most less-expensive foams, this one has been known to sag over time, but it’s still a good choice for customers looking for a compromise between luxury and budget-friendly.